MIAMI — Don't try to predict what Yu Darvish can do. The mercurial right-hander proved that during and after earning his first victory of the season Monday night in the Cubs' 7-2 win over the Marlins. Darvish threw a season-high 5 2/3 innings despite walking four and hitting the Marlins' Lewis Brinson on his 96th and final pitch after walking none in his previous start Wednesday against the Pirates. When asked about his inconsistency, Darvish replied, "I'm Yu Darvish. I walk guy(s)." There's also the issue of his repertoire. Darvish struck out Brian Anderson on a 96-mph fastball for the second out in the bottom of the first inning before experiencing his bout of wildness. Darvish began to veer away from his fastball and slider by throwing more curves, including a 76-mph breaker to whiff Curtis Granderson for the first out in the fifth. "I'm trying to throw more curves because I'm always throwing fastball, slider, fastball, slider," Darvish said. But after getting into a jam later in the inning, an animated Darvish struck out Miguel Rojas on a slider to end the fifth and to the delight of manager Joe Maddon, who liked the emotion and determination displayed by his pitcher. And as a closing act, Darvish actually increased his velocity to the 98-mph range before hitting Brinson on the upper leg. 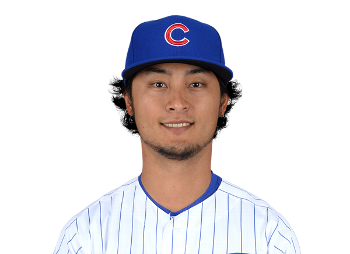 "I just want a challenge for me," said Darvish, whose fastball has usually topped out at 95 mph since joining the Cubs last season. "That was my last inning. That's why I threw as hard as I could." The Cubs signed Darvish to a six-year, $126 million contract prior to the 2018 season because of his strikeout potential, but they hadn't witnessed his velocity registering this high until Monday. "I'm trying to throw as hard as I could _ not for the strike zone _ just as hard as I could," Darvish said. "I should do that for next time." "Seriously, I'm thinking too much about (throwing) strikes." Darvish also unveiled a two-seam fastball for the first time and felt comfortable. "I know he can throw that hard, but at the end of the game I didn't expect that," said Willson Contreras, who was impressed by the movement and velocity on the two-seam fastball. Contreras said reducing the walks would be a bonus, but "(Darvish) can't go out there doubting himself." "He's got to be aggressive to everyone," Contreras said. "Those (walks) will happen. (But) I'll take (the results)." Contreras ripped his team-leading sixth home run in the seventh after getting drilled on the left forearm by a pitch from starter Trevor Richards in the fifth and having a few words that riled the Marlins momentarily. "I didn't say anything to nobody," said Contreras, who knew Richards wasn't trying to hit him but feared he could have broken a bone. "I said it to myself."